Today is the kick off for the third San Francisco Food Bank Hunger Challenge. Twenty five bloggers (as well as others in the community) are spending just $4 a day per person for all their food and beverages for seven days to get a feel for what it is like to subsist on food stamps (which are now called SNAP). Some will be blogging about how they cope with the limitations of such a budget, others will be writing about hunger in the Bay area and elsewhere. Some will be creating menus, recipes and shopping tips that the food bank can share with their clients to help make existing on such a budget as filling, healthy and easy as possible. Many of the participants will be posting on Facebook and Twitter as well. The Hunger Challenge participants have also helped to raise awareness, literally tons of food donations and cash contributions not just for the San Francisco Food Bank, but for food banks across the Bay area. You can learn more about the Hunger Challenge at http://www.hungerchallenge.blogspot.com/ and get all the links and the Twitter handles to follow along. 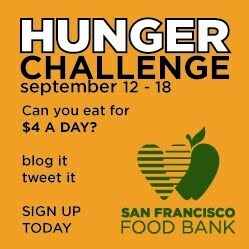 Or if you'd like to sign up and give the Hunger Challenge a try (even for a day or two), you can also sign up there. You don't need a blog or even a Facebook or Twitter account to join in, but if you do have one or more of those, please help spread the word about the importance of food banks (the SFFB estimates 150,000 San Franciscans a day face hunger) and the need for continued and improved funding for programs such as food stamps. This is the third year that I've participated. You can see everything I posted on the 2008 challenge here, including shopping lists, daily menus, meal planning tips and more. In 2008, we only had $3 a person a day to work with, so filling up my family of four and keeping the food nutritious was even more challenging. (The extra dollar a day really makes a difference, but it is just a temporary change and is due to expire.) I think the Hunger Challenge Chili was my favorite recipe from that year. I also feel that what I wrote in my wrap up/recommendations for change post still sums my experience and what I learned and what I would like to see change to make it easier for Food Bank clients and those on food stamps to feed themselves and their families as well as possible. You can read about my 2009 experience here. In 2009 we were able to use $4 a day per person. Like the year before, I also planned out a weekly meal plan, gave shopping trips, shared about my experiences and developed recipes. Probably my favorite from 2009 was the Hunger Challenge Cassoulet (a bean and sausage stew). I summed up my reactions here. This year, I'm going about the challenge a bit differently. I'm figuring out the cost of each meal and keeping it to about $1.25 or less per person. I'm developing menus day by day rather than by the week to highlight the different needs of different communities -- for example: organic, kosher, ethnic and others. Each has its positives and negatives and I look forward to sharing them (and the recipes) with you. Please look for my daily Hunger Challenge update. If you have any experiences with food banks, food stamps or budget meals you'd like to share, please feel free to leave a comment. If you would like information on how to help in your area, please go to Feeding America to find a food bank. For more information on the San Francisco Food Bank, click here. We really appreciate all your support and your willingness to take the Hunger Challenge three years in a row! Best of luck this year. Thank you!